Beautiful area rug. I’ve had it outdoors for over a year and it still looks new. Go tropical with a flourish in vivid Caribbean style. This delightful collection of quality loomed rugs provides an instant housewarming. I bought this rug to use in my art room. I also have a small sitting area which is now everyone’s favorite spot. The rug is soft to my bare feet (I live in the south, easy to clean and “happy”. Everyone loves it, especially me! 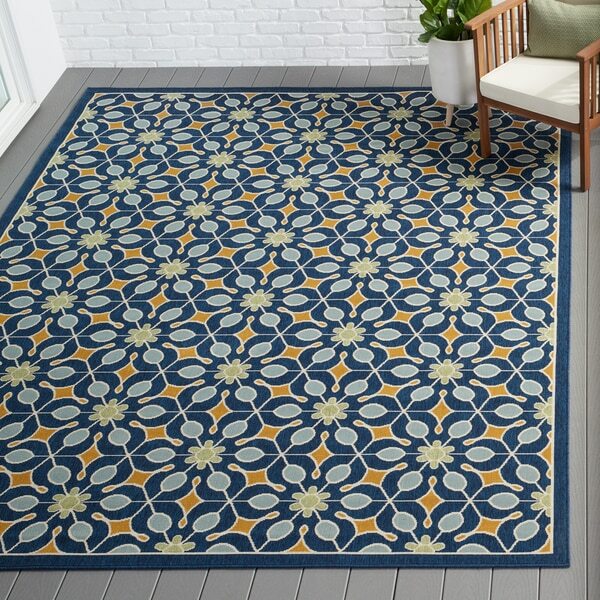 Beautiful outdoor rug that feels nice under bare feet. Great quality and durability..the rug has endured two dogs, teen boys and the hot Florida humidity all summer! 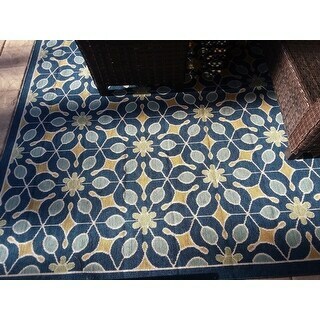 We purchased this rug for our outdoor dining area and are very pleased with the quality, design, and color way. It adds just enough pattern and color to our pool area to pull everything together. ooohh I love, love, love this rug! It is so big and the colors are very bright. Everyone that has seen this rug has wanted it! I would recommend the rug; we are using indoors! 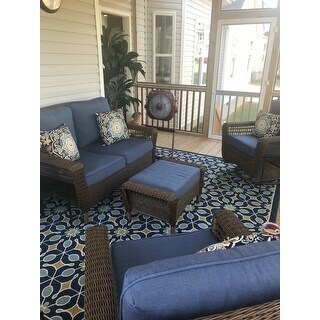 I have received so many compliments on this rug and it matches perfectly my patio set purchased from *** No one can believe they were separate purchases because they match so we'll! Thank you Overstock.com! Love the colors of this rug. Perfect for our outside deck, but take up in the winter and dry it out. I noticed that the rug will retain water and not air dry easily. For summer rains and longer dry spells no problem, but if you expect a lot of rain, like do in the spring and fall in PNW, then store it away. Keep it clean because the pile on the rug will attract food. Great indoor/outdoor piece. It has fantastic visual interest and the colors are as pictured. We used this in a lobby area and it was just the pop needed. This is my second one. Got the first one last yr and it held up great! love this rug, exactly as pictured. This rug is beautiful in my sunroom/den, so happy with my purchase! Matches my patio furniture & pillows I bought at Home Depot perfectly.